"This is an absolute disgrace and the speaker should hang his head in shame," said Rep. Eliot Engel, D-N.Y.
Members of the House of Representatives ended the current term of Congress without holding a vote on aid for Sandy victims. New York area-lawmakers in both parties erupted in anger late Tuesday night after learning the House Republican leadership decided to allow the current term of Congress to end without holding a vote on aid for victims of Superstorm Sandy. Rep. Peter King, R-N.Y., said he was told by the office of Majority Leader Eric Cantor of Virginia that Speaker John Boehner of Ohio had decided to abandon a vote this session. Cantor, who sets the House schedule, did not immediately comment. 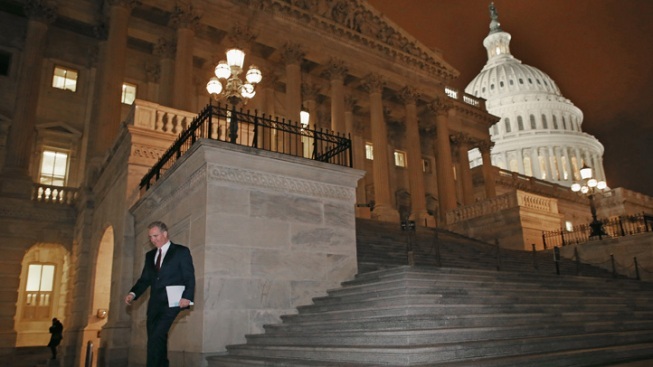 House Democratic Whip Steny Hoyer of Maryland told reporters that just before Tuesday evening's vote on "fiscal cliff" legislation, Cantor told him that he was "99.9 percent confident that this bill would be on the floor, and that's what he wanted." A spokesman for Boehner, Michael Steel said, "The speaker is committed to getting this bill passed this month." In remarks on the House floor, King called the decision "absolutely inexcusable, absolutely indefensible. We cannot just walk away from our responsibilities." The Senate approved a $60.4 billion measure Friday to help with recovery from the October storm that devastated parts of New York, New Jersey and nearby states. The House Appropriations Committee has drafted a smaller, $27 billion measure, and a vote had been expected before Congress' term ends Thursday at noon. More than $2 billion in federal funds has been spent so far on relief efforts for 11 states and the District of Columbia struck by the storm, one of the worst ever to hit the Northeast. The Federal Emergency Management Agency's disaster relief fund still has about $4.3 billion, enough to pay for recovery efforts into early spring, according to officials. The unspent FEMA money can only be used for emergency services, said Rep. Frank Pallone Jr., D-N.J.
New York, New Jersey, Connecticut, District of Columbia, West Virginia, Virginia, Maryland, New Hampshire, Delaware, Rhode Island, Pennsylvania and Massachusetts are receiving federal aid. Sandy was blamed for at least 120 deaths and battered coastline areas from North Carolina to Maine. New York, New Jersey and Connecticut were the hardest hit states and suffered high winds, flooding and storm surges. The storm damaged or destroyed more than 72,000 homes and businesses in New Jersey. In New York, 305,000 housing units were damaged or destroyed and more than 265,000 businesses were affected. "I'm here tonight saying to myself for the first time that I'm not proud of the decision my team has made," said Rep. Michael Grimm, R-N.Y. "It is the wrong decision, and I' m going to be respectful and ask that the speaker reconsider his decision. Because it's not about politics, it's about human lives." "I truly feel betrayed this evening," said Rep. Nita Lowey, D-N.Y.
"We need to be there for all those in need now after Hurricane Sandy," said Rep. Gregory Meeks, D-N.Y. The House Democratic leader, Rep. Nancy Pelosi of California, said she didn't know whether a decision has been made and added, "We cannot leave here doing nothing. That would be a disgrace."